Microelectronic engineering professor Santosh Kurinec was inducted into the Women In Technology International Hall of Fame on June 11. 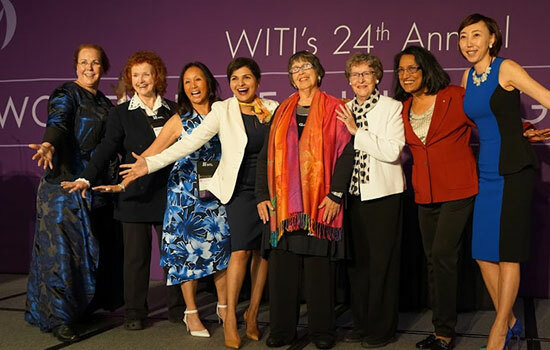 Honorees and Women in Technology International leaders are (left to right) Rhonda Childress, honoree; Peggy Kilburn, WITI conference director; Roz Ho, honoree; Rashmi Rao, honoree; Carolyn Leighton, founder and chair of WITI; Elizabeth Feinler, honoree; Kurinec; and Yanbing Li, honoree. Kurinec, a microelectronic engineering professor in RIT’s Kate Gleason College of Engineering, is an expert in photovoltaics, solar cell technologies and integrated circuits—the essential elements of today’s electronic devices. “The semiconductor and related industries need top quality engineers, and we are creating them,” said Kurinec, who was also recognized as an accomplished teacher and mentor whose students understand the complexities of the semiconductor fabrication process, and who have gone on to positions with NASA, Intel, Boeing and SpaceX. As part of the RIT faculty since 1988, Kurinec is one of the leading researchers in the area of photovoltaics, non-volatile memory and advanced integrated circuit materials and processes. Her extensive work has resulted in the development of novel materials and devices in the Semiconductor Manufacturing and Fabrication Laboratory, the clean room facility in the engineering college. From 2001 to 2009, she was department head of microelectronic engineering. Since 2008, she has served as a visiting scholar and researcher at the IBM Watson Research Center in Yorktown Heights, N.Y. In 2016, she received the International Association of Advance Materials Medal for outstanding contributions in the field of advanced materials science. It would be only one of many awards bestowed by RIT and the engineering community for her many contributions integrating research into undergraduate engineering education and her focus on developing the next generation of microelectronic engineers. She received the international engineering society’s 2012 Technical Field Award for Undergraduate Teaching, and was designated an IEEE Fellow by the institute in 2010. In the past few years, Kurinec has participated as a visiting lecturer and conference chair person in Qatar and Saudi Arabia, discussing the electronics industry, product development and advancing women in STEM professions. In his nomination letter, Muhammad Mustafa Hussain, professor of electrical engineering, King Abdullah University of Science and Technology, Saudi Arabia, recognized Kurinec as a dedicated leader and a formidable ambassador of women in engineering, enabling collaborations with other women scientists and faculty.